Our recent trip to Europe went really well and there was little else we could really hope for other than a safe passage back to Manila. 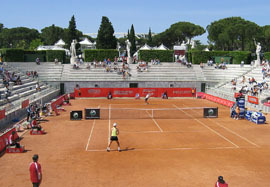 My daughter is an avid tennis player and before we even got to Rome she had mused out loud whether tickets to the Italian Open would be at all possible. We answered with a â€œlukewarm letâ€™s seeâ€ but frankly, I didnâ€™t think chances were good. I have been to the U.S. Open before, with a center court seat for the semi-finals, and those tickets were wicked hard to come byâ€¦so I just assumed the Italian Open was a tall order as wellâ€¦ As luck would have it, my wifeâ€™s relatives asked The Kid what she really wanted to do in Rome and â€œpoof!#@!â€ â€“ tickets to the Foro Italico two days before we left for Manila appeared! The shrieks, squeals, bouncing up and down, heartfelt thank youâ€™s, smiles and shivering with glee were all signs that this was itâ€¦that one moment in a trip that you know she will remember forever. Forget the Van Goghâ€™s, the Sagrada Familia or massive Zara shops, the leaning tower of Pisa or charming towns of San Gimignano or Siena, letâ€™s go see some tennis stars!!! We decided to watch the Number 2 seed Kim Clijsters of Belgium on center court. As she demolished her unseeded opponent, my daughter decided she was going to get Ms. Clijsters autograph as wellâ€¦and now I know that when she puts her mind to something, she does everything she can, but politely, to achieve her goal. She stealthily moved to the section of the stands right behind Ms. Clijsters seat, two games before the end of the match. Then at the right moment, as everyone else was screaming for an autograph, The Kid firmly, but loudly said, â€œMs. 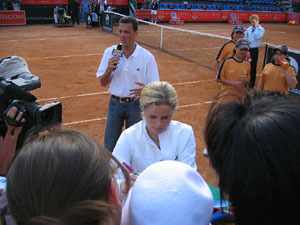 Clijsters, may I trouble you for an autograph please?â€ and hers was the first ball signed while it was broadcast on Italian television (thatâ€™s my daughter in the hat again) !! !â€¦ I had rushed to a few feet behind her as I thought she might get crushed by the crowd that surged to the court’s edge and just managed to click this photograph for posterity… Walking on air is an apt way to describe the rest of The Kid’s day! Millions of thanks to her Tito who made this all possible!!! fabian, you are right, she’s from Belgium, I have changed post, it must be the effect of that “other” Belgian, Justine Henin Hardenne that causes the confusion… bay leaf, here’s a little trivia, did you know that one of Federer’s first coaches (when he was like 11), was Filipino, he’s now back in Manila and gives lessons? Fried neurons, you gotta see the Italian Open, the grounds are spectacular! MM, interesting about the Pinoy coach, what’s his name? The coach i know who trained him at an early age was Sepp Kacovsky (he still works at Old Boys Tennis Club in Basel) followed by the late Peter Carter. Anyone heard of our very own Alan Zafra? He is now based here in Swizerland and is a tennis coach. Bay leaf, the kid’s tennis coach says Beeyong Sison, who now coaches at the International Tennis School (ITS) Academy in Subic, once taught Roger Federer at an early age (when Federer was 11 or 12). Beeyong apparently was a Swiss National Assistant Coach and helped set up the ITS in Basel, Switzerland. Thank you for this info, Mrs. MM! In fact i’ve been prodding him (everytime i get the chance to get close to him) to come to the Philippines to enjoy our beautiful beaches. Unfortunately he’s got a very hectic schedule and it’s out of the way. lol, actually Roger was a brat when he was younger, throwing tantrums and rackets all over the place. He’s more controlled now. Off court though, he’s a normal guy, and very down to earth. Mrs. MM, i just found out that Beeyong Sison even played doubles with Heinz Gunthard when he was living here. HG is a former tennis pro and used to be Steffi Graf’s coach. He is now commentating for Swiss tv. Will “The Kid” turn pro? You might have to go back to the states and go to the Sunshine State. Good luck and what a lucky kid to be able to get exposed to the outside world at an early age! MM, I’m glad you posted this! Such a pleasant article to read! JRodriguez and bay leaf…no, The Kid’s tennis is recreational sport for now…not competitive tennis…but she does appear to enjoy it!